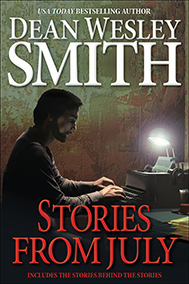 USA Today bestselling author Dean Wesley Smith decided to take his love for short fiction a step forward. In July of 2015, he wrote thirty-two short stories, one per day and one extra. Then, every day, he also wrote a short article about the writing of the story. Now the articles and stories combine into this major collection that also works as a master class on the art of storytelling. Follow a professional writer through a month of creation and enjoy some wonderful fiction at the same time.